Are you ready to go beyond advising and planning to actively advocating the interests of your elderly clients? You can be, with this two volume handbook from two veteran elder law advocates. 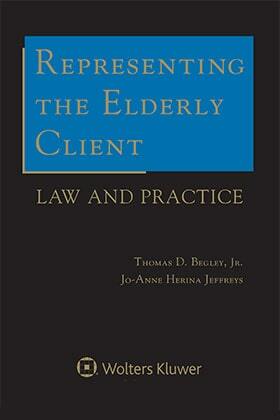 In a systematic and practical fashion, the authors address each key practice issue and provide an overview of the basic rules and guiding statutes/regulations, in-depth analysis of elder law practice together with guiding case law, and step-by-step explanation of the advocacy process, revealing how law operates in the real world and where things can go wrong. Plus you'll get their practice-tested minisystem for effective advocacy. Intra-family and Postmortem Advocacy for Elderly Clients and Heirs. Practice forms, flowcharts, and tables put all essential information at your fingertips. The forms contained in the Author's Advocacy Mini-systems will save you hours of preparation time. Start finding effective solutions to your elderly clients' problems with Representing the Elderly Client: Law and Practice. Along with your Representing the Elderly Client three-volume print set, you'll receive a FREE CD-ROM containing word processing documents used in handling some of elder law's most complex concerns.